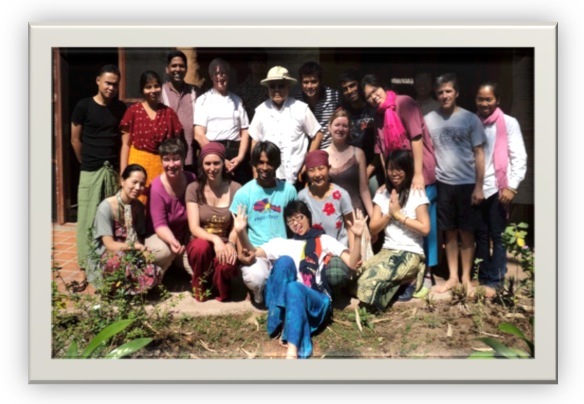 We joined the 2011 Thailand EDE (Ecovillage Design Education) and TOT (Training of Trainers) in WONGSANIT ASHRAM, with 20 people from different cultures & backgrounds: Cambodia, Scotland, India, England, Indonesia, China, Hong Kong, Canada, Thailand, South Africa, and Bangladesh. This course promotes people to take an active role in change in our community and our self, that will bring important transformation on Earth. EDE was more than what I expected. We learned so many things and I gained a lot of inspiration. Now I start to think about my community how they can understand their problems, and know the cause of those problems. So I am also inspired by my community because after EDE I understand so much more. EDE give me a way to think and see with a new vision and a new mind. 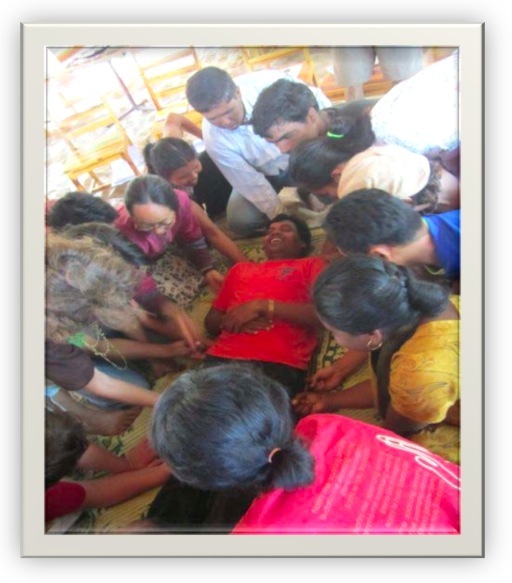 During the course we started with community building. We are from different cultures and backgrounds but during community building, we all help each other like deep friends, and just one and two days into the course our friendship looks like we have been friends for a long time, with a lot of open mindedness and helping each other. This helped to give us new spiritual power, a step closer to being enlightened. Every day we have morning and evening meditation and deep relaxation for understanding our mind and suffering. We also have a weekly well-being circle, where we all of participate by sharing from our heart and listening from our heart. It really impacted deeply on all of us. Some cry, some laugh, some have no power to share, and some we can read their face and know how they are feeling. A key topic I learned about was the Transition Town movement. It is a small step for change in the world. People talk about changing the world but most people do not take any step towards that. If some take step so they affected by people, community. how we not affected by other people. EDE can help us to understanding. If we want to understand we have to be with nature then we can understand the problem and we can feel how much nature is suffering. Nature is suffering more than us, so now this is the time for us to do something for nature. EDE can help. During the course I also learned about how to use our resources in the best way, and how can we save and conserve our natural resources. We visited some places like Surin province in the Northeast to see some of the practical steps already taken by people and their communities -Green market, local economy, organic farming – that really give new possibilities. Lastly in the course, we had Design studio, where we used our EDE learning for practical application. This was really effective for us, to practice with the support of one EDE designer Max, who was such a wise man. He is the founder of Crystal Water eco-community in Australia. I learnt how to respect other cultures and other people thoughts and ideas different to my own. How we can live with different cultures and different ideas with harmony. EDE gave me so much energy to stand in this world and do something defferent. To do something for nature and our Mother Earth, and how I can take my first step and how I can walk that step. That is what I learned from EDE. Joining the Ecovillage Design Education and Training of Trainers courses helped me build up the knowledge, skills and self-awareness to care, love and be responsible, using critical thinking and taking action in society – at national or international levels. Through these lessons, practicing and sharing, my understanding of the personal, community and institutional levels deepened. In the EDE, I learned to understand my self, others ,and the environment in order to connect and communicate with the needs, willingness and skills in me and around me. It helped me to see and reflect more on the life aspect of society and the world and how to change and be a change or supporter for others. Starting from knowing there is a problem, to understanding the cause of the problem and possible solutions, to knowing how to bring these solutions to all four dimensions of life – the worldview, social, economy and ecological dimensions. In the worldview aspect, I learnt how to understand and analyze the value of the paradigm or belief system that shaped me. I learnt about the modern paradigm ? scientific – and the traditional paradigm – culture, religion, etc. Knowing that since my birth, I have been conditioned by my parents, teachers, media, culture and institutions. These things made me blind and ignorant to my inner world and the world in general. We are consumers of ignorance due to the fact that we are disconnected from one another. 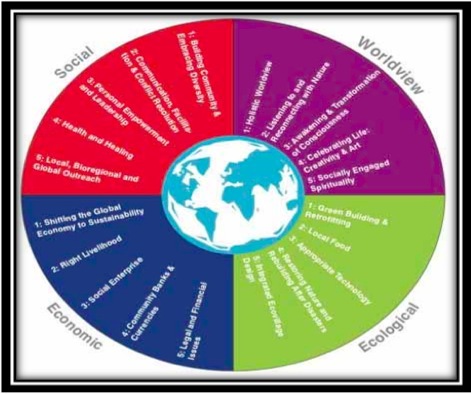 So, we really need to have a holistic worldview, linking spiritual, material and cultural values in order to bring people into interconnectedness and sustainable living. In the social aspect, I learnt about living in community by building relationships, non-violent communication, self-awareness, involving process and having common goals. In the economy aspect I learnt how to build up the foundations of a community with spiritual values, stability and sustainability in eco-friendly production systems, counter-balancing consumerism and capitalism. In the ecological aspect, I learnt about introducing biodiversity in farming and about permaculture vs. monoculture, creating sustainable and regenerative systems. The EDE inspired me to integrate and build connections to what I’ve learned to walk in my life. I learnt that I can make my dreams happen. With commitment to learning, practicing and sharing, and the confidence to facilitate and raise other’s awareness, these experiences can be transferred into action among family, friends and community. I learnt about Eco village concept and Eco design studio for increasing my knowledge and skills, and for using those skills effectively in my community. To facilitate community transition to a new paradigm, I learned building and embracing diversity, Transition Town movement, deep listening & reconnection with nature, green building, so many more things. This training has given me encouragement to pursue knowledge in many new aspects. Many aspects and topics of the training were new ideas to me. Now I have learnt those things, along with learning how to facilitate community and raise awareness. I have also learnt ecological design and Eco-sustainable life. I learnt new practical ideas like how to make organic pro-biotics.I also know the importance of building community and embracing diversity: building community means making deep relationships within the community among each other. No discrimination, no violence, no competition, but to have unity for helping each other. 1. Worldview: A new understanding of the natural laws of the world, seeing the world as a whole, understanding why we have an influence on the whole. What does a socially committed spirituality which gives us the power we need to make our contribution look like? The emphasis in Tamera (an Ecovillage in Portugal) is on community knowledge, developed over more than thirty years’ experience. The students will learn and experience the basics of communication in community, truth, the creation of trust and conflict resolution: What are meaningful structures for a new co-habitation? How can we develop an understanding/communication which creates truth and trust ? also in the core areas of community, in love and sexuality? The world needs models in which people really live together without continually reproducing war on the inner human scale so that a new culture of peace on earth can develop. How do we deal with the issue of money in a healing way? How can we direct money into the development of sustainable systems instead of war and consumption? We will study the themes of Spiritual Economy, Barter Systems and Alternative Currencies.